Z Scene Manager: A SubTool organizer plugin for ZBrush! 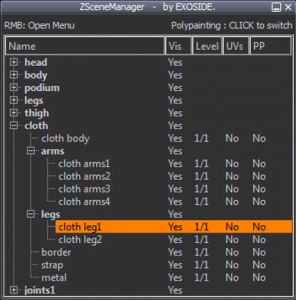 What is Z Scene Manager? This plugin for ZBrush allows to hierarchically arrange and group your SubTools into folders in a dedicated window. The ‘Merge for Sculpt/Paint‘ feature provides a simple way to work on multiple SubTools all-as-one. Based on SubTool selection, It becomes easy to sculpt, paint, move, rotate, scale multiple subtools simultaneously. Unlike TransposeMaster, it allows to work at any subdivision level. This allows to sculpt or paint multiple SubTools at high SubD level while keeping SubD levels. Save multiple masking and polygroups configuration with ‘Buffers Window’…..
Align and Center selected SubTools on TransposeLine or on main axis..
Visibility configs allows to quickly switch between different configurations of your Tools. More generally, ZSceneManager greatly improves and speeds up your workflow when you work on a lot of SubTools. … more features coming soon…..
ZSceneManager is available on both Windows and MacOSX OS. It’s compatible with ZBrush 4R4, 4R5, 4R6, 4R7 and 4R8. A video overview of ZSceneManager’s features is available here : Overview video ! A FREE but feature-limited version. The FREE version has a limited number of features. It has NO time limitation, you can use it as long as you want. A PRO version which costs $29. The PRO version contains all the features. Every future PRO version 1.x will be free of charge for every one who already bought a license of the PRO version.